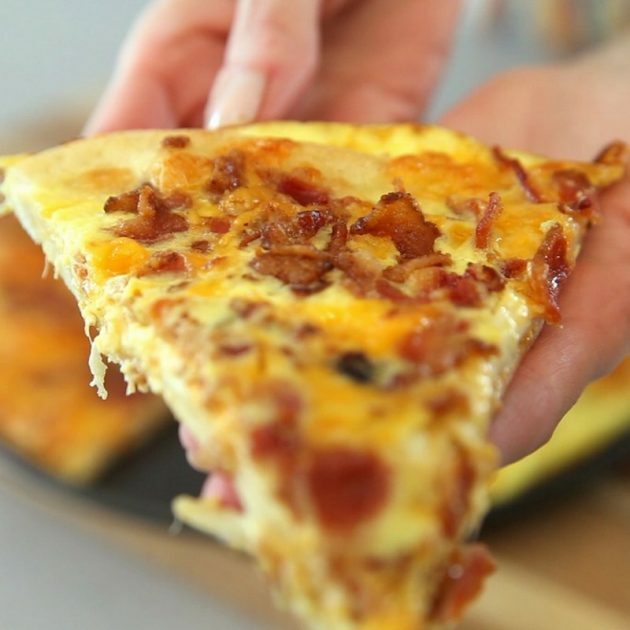 Bacon Egg & Cheese Breakfast Pizza is one of our most popular recipes along with our Omelet Breakfast Croissant Boats and Egg Muffins. 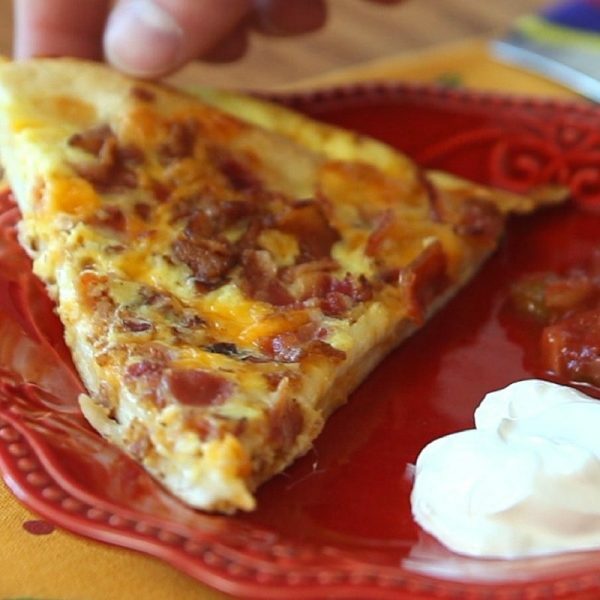 There’s simply nothing better than waking up to the smell of bacon and eggs, but this time it’s in pizza form! We’ve served it to rave reviews for family breakfasts on weekend, Thanksgiving, Christmas, Easter and Memorial Day. As long as it’s not too hot to turn on the oven, we make it without thinking twice. 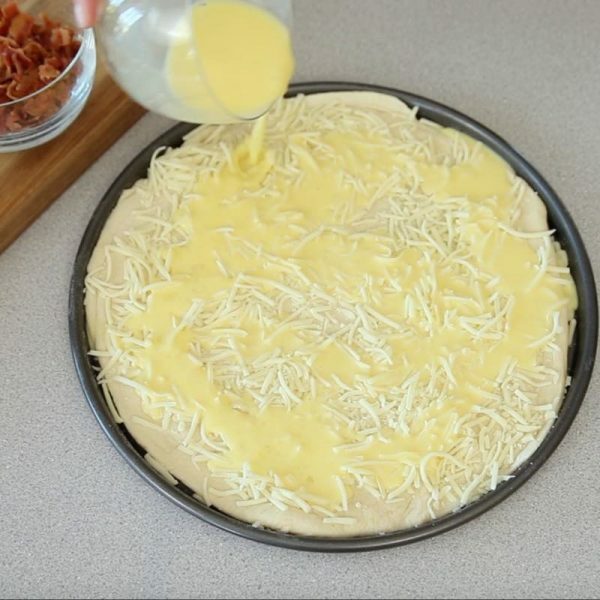 Start with a refrigerated pizza dough and stretch it to fit into a pizza pan like this one. Combine the eggs and milk in a small bowl, and pour them as evenly as possible over the crust. It’s ok if you get some drips over the edge. Then sprinkle the cooked bacon and cheddar evenly on top. Bake it in the oven and it’s ready for a quick 15 minutes. You’ll know it’s ready when the cheese is bubbling and he crust is getting golden. Or you’ll be drooling! Serve it up with some salsa or sour cream. It’s great on its own too. Avoid overcooking, otherwise, the eggs could become rubbery. When they are done, there won’t be any extra liquid from the eggs. Place the rack in the middle of the oven. You can precook the bacon the night before to save time in the morning. As each oven works differently, I would recommend checking doneness after 10 to 12 minutes. Less time will yield softer crust and longer time will give you crispy crust. Add vegetables such as onion, mushroom or bell peppers. Add 2 tablespoon sugar, ¼ cup olive oil, and 2 tsp salt into the yeast mixture. Add 4 cups of all-purpose flour and mix well. 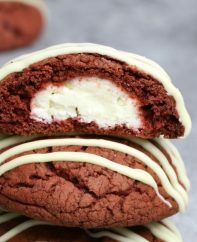 Use your hand to make the dough into a ball shape. Cover the bowl with plastic wrap and let the dough rest for 45 minutes until the dough has doubled in size. 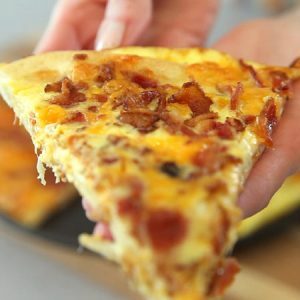 This easy Breakfast Pizza is loaded with bacon, eggs and cheese for the delicious start to your day. 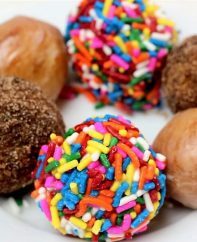 Perfect to share for breakfast or brunch on weekends and holidays, and it'll be on your table in just 20 minutes. Preheat oven to 425°F. Set aside a large pizza pan or baking sheet. Fry or microwave the bacon until half-cooked and drain the fat. Meanwhile, make the pizza. Flour a large work surface and roll out pizza dough to fit the size of your pan. Using your finger tips, slide the dough onto the pan. In a medium bowl, whisk together eggs and milk. Pour over pizza dough. 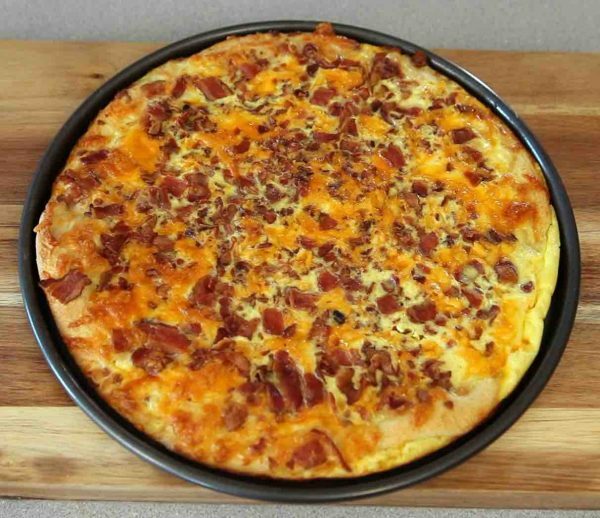 Top the pizza with the cooked bacon and cheddar cheese. Bake for 10-15 minutes in the top half of the oven until the cheese is bubbling. Remove from the oven. Serve warm with optional sauces and enjoy! 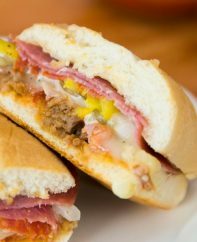 -For a lighter option, use part-skim mozzarella cheese, low-fat cheddar cheese and reduced sodium bacon. can this be frozen for later? if so how long is it good for in the freezer. This is a five star breakfast. My first comment only registered 3 stars. Definitely a 5 star recipe. I didn’t care for the amount of egg vs dough. My husband loved it but I think I was craving more eggyness. I would make pizza smaller with built up sides and more egg. Probably more pie like. I’ve also had it with frozen hashbrowns on it. This is the perfect recipe for my Christmas brunch. Will serve it with the French Toast casserole,with Maple syrup. Thank you so much. It looks delicious, and the additions are endless! Has anyone ever made this with ready made crusts?